Those of us who build strength and muscle are hyperaware of our protein intake. We certainly aren’t like many of my non-bodybuilding friends, some of whom could eat a bag of corn chips and wonder if what they’d just eaten was protein. I wish I could say that’s an exaggeration, but it’s not. Athletic people realize the value of this super-constructive macro-nutrient. Even if we don’t count the number of grams of protein consumed at every meal, we certainly are aware of whether we’ve eaten it. And given our high regard for the ‘building blocks’ of the three macros, we’re more likely to err on the side of too much rather than not enough when it comes to unmeasured protein intake. Even more specifically and relevant to most of us: ‘Is high protein bad for kidneys’ in people with normal kidney function? 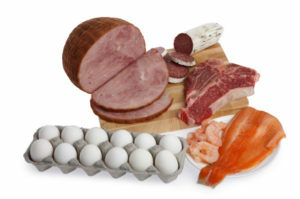 Typically, a high protein diet is considered one in which .55 grams per lb. of bodyweight (1.2 g/kg of BW) or more of protein is consumed daily. This will sound like a number too low to even be considered adequate for many bodybuilders, power lifters, and athletes. It puts a 200 pound guy at an intake of 110 grams – an amount taken in by roughly five egg whites, a chicken breast, and two scoops of whey protein powder. It’s not uncommon for some physique builders and strength athletes to consume up to twice this amount. Personally, 1.2 g/kg of bodyweight would put me at just under a hundred grams of protein daily, a number no more than half what I know I’ve consumed on countless days of my yesteryears. I have a proclivity for the carnivorous and my heretofore protein intake until the present day has probably been well above average. This makes the “is high protein bad for kidneys” question personally relevant. Eating twice this much protein would be considered extremely high. But some top level bodybuilders and strength athletes have certainly been known to do this, and for extended periods. This doesn’t mean there aren’t drawbacks to consuming over 200 grams of protein daily. It can definitely add unwanted body fat while being the most expensive form of food to buy. The following chart breaks down the number of grams of protein as a percentage of three total calorie intakes, with the remaining calories to be split between carbohydrates and dietary fat. Does High Protein “Strain” the Kidneys? Filter the blood and remove waste; all the body’s blood passes through the kidneys several times a day. Produce and release certain hormones like Erythropoietin and Calcitriol. The filtration area of the nephron is called the renal corpuscle. It contains a section called a Bowman’s capsule, connected to which are a network of capillaries called Glomerulus. It is the filtering area between the Bowman’s capsule and the Glomerulus, called the ultra-filtration barrier, where waste is filtered out of the blood. This section works somewhat like a kitchen strainer, trapping large items and allowing smaller waste to get through. The rate at which this filtration takes place is called the glomerulus filtration rate (GFR). If the rate is greatly reduced for three months or more, the condition is defined as Chronic Kidney Disease (CKD). Damage caused by a number of other diseases and conditions, like diabetes or chronic hypertension, can lead to GFR and possibly, CKD. Is High Protein Bad for Healthy Kidneys? This is the real question, given we know it’s detrimental to kidneys with impaired functionality. A possible parallel example of hyperfiltration being a normal adaptive mechanism is seen in pregnant women. The authors cite that during pregnancy, a healthy woman’s GFR can increase by as much as 65%. It usually doesn’t return to normal until three months postpartum. Despite this, pregnancy is not considered a risk factor for CKD. Furthermore, in a randomized study of 65 overweight (but otherwise healthy) individuals, subjects were given either a low or high protein diet to follow for a six-month. The high protein group had a significant increase in both kidney size and GFR above baseline during the trial. However, the researchers observed no increase in albumin excretion in either group. It was concluded that despite acute changes in renal function, there was no long-term detriment to kidney function from high protein intake in healthy individuals. In another study, this one of 37 athletes, researchers found that protein intakes of 1.4–1.9 g/kg/day did not impair renal function. These amounts are 170 to 243% above RDA. This doesn’t mean I’m recommending a high protein diet. Be sure to run any dietary ideas such as this past your doctor. But I’m personally not going to worry about my carnivorous predilection. I’ll just continue to enjoy high protein consumption for the satiation, stabler blood sugar, and strength it provides.